During my 2008 trip to Chaco Canyon, New Mexico, I had the opportunity to visit one of my favorite places in all of the Southwest – Kin Klizhin Ruin, located at the very edge of the Chaco Culture Historical Park. 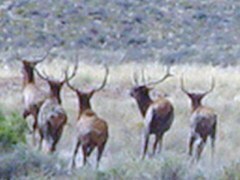 Situated eleven miles to the west of the Visitor Center, one first takes a dirt road, then a four wheel drive road over open country to get to Kin Klizhin. 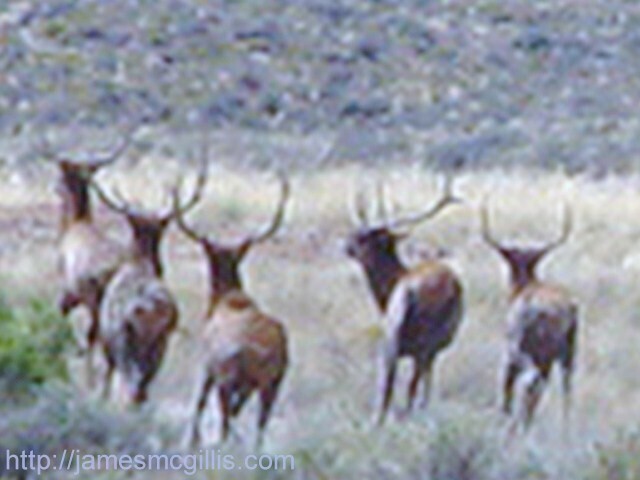 Last September, on my trip to Kin Klizhin, I startled a large herd of elk that was watering at a small catchment basin just off the lonely dirt track. 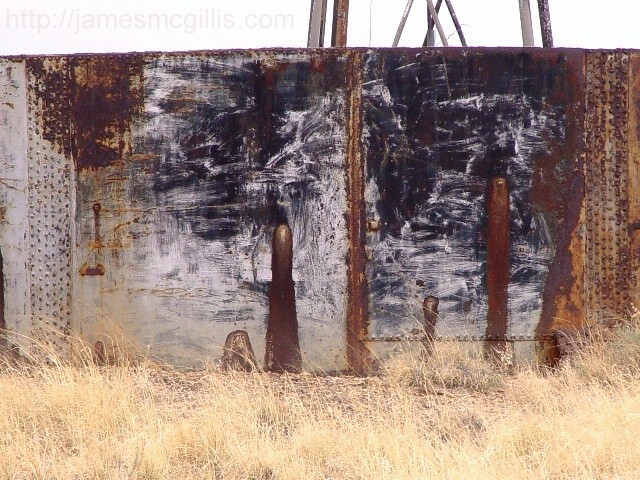 This spring, there were no elk to marvel at, but I did take the time to drive up to the derelict Aermotor windmill that stands on a prominent hill near the dirt track that serves as an access road. 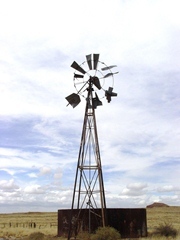 The Aermotor Windmill Company is famous throughout the West, as the dominant maker of windmill water pumps. As the average water table has sunk over the years, many of these windmills have fallen into disrepair and destruction. 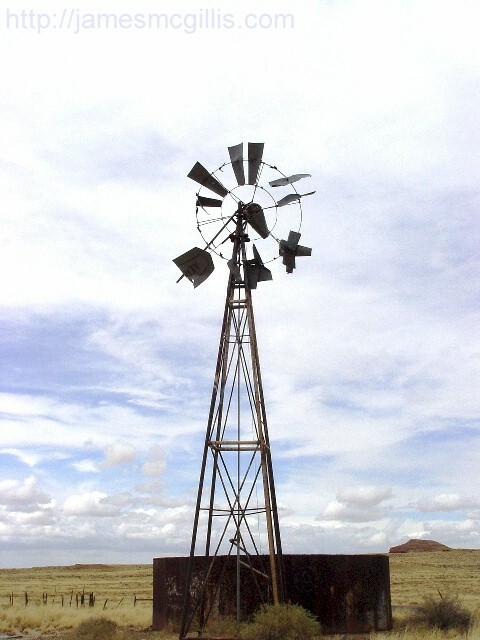 Although the welded steel towers can withstand wind speeds approaching tornado-strength, the active mechanism of the windmill is much more delicate. Thus, many of the West’s windmills are little more than shattered remnants of their former elegant, yet utilitarian selves. This particular windmill had a cast-iron storage tank the size of a large home swimming pool. Held together with hundreds of bolts and coated with rust-preventative tar and paint, the sandblasting wind has created a scene (below) of unexpected artistic effect after all of these years. Although the sky threatened rain, there was not a drop of water anywhere in or near this former human made oasis. When the water gave out, the land could no longer support cattle grazing, leaving this relic for the occasional visitor to ponder. 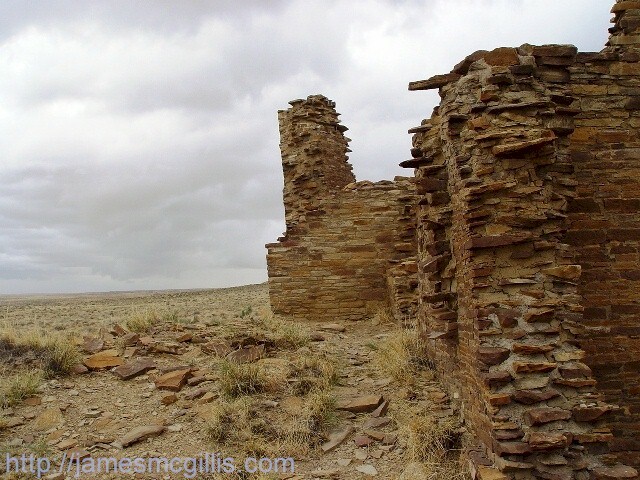 Archeologists have hypothesized the Kin Klizhin Ruin as the farthest outpost directly related to Chaco Canyon and its unique pre-Puebloan Indian culture. 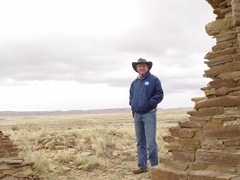 Standing on a hilltop, the original structure featured an above-ground ceremonial kiva that is unique to the Chaco area. Ancestral Puebloan residents of this “early Chacoan visitor center” dammed the Kin Klizhin Wash, which is a seasonal tributary to the Chaco River; itself dry most of the year. There is evidence that early residents planted extensively and used irrigation water to sustain their crops. One can imagine a pre-Puebloan tourist or pilgrim making his way over many miles of arid desert, only to find this substantial structure, standing as a cultural outpost and welcome center for those who approached Chaco Canyon from the south. Standing at the Kin Klizhin Ruin, a current-day visitor can see for miles, but other than the ruin, the only sign of man is the single dirt track that leads back past the abandoned windmill to what we call civilization. It is widely suspected that drought and water shortages around 1200 CE contributed to the Great Disappearance of Chacoan culture. Here, in the last fifty years, drought and water shortages similarly led to the demise of the ranching culture near Chaco. As I stood at the ruin and stared, I realized that the temperature was dropping fast and that rain clouds were approaching. There was little time to contemplate the fine architecture and solidity of the ruin. Instead, my instincts told me that it was time to make a run for my truck, parked one hundred yards away. By the time that I was halfway to the truck, the rain hit. Once safely inside the cab, I watched as sheets of water quickly washed the road dust from my windshield. 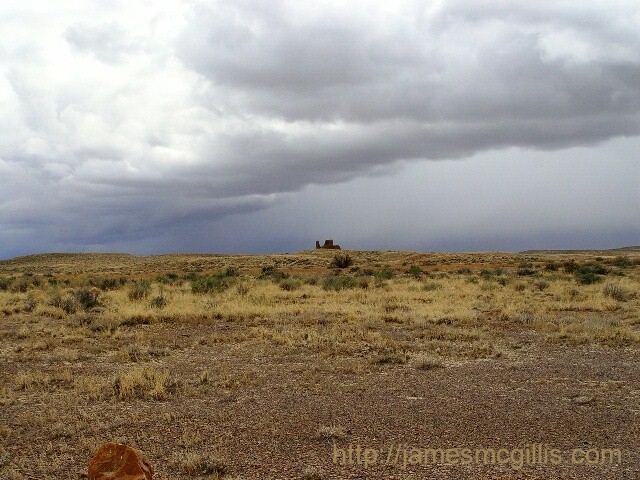 On my way back to my campsite at Chaco Canyon, I encountered a lone driver in a pickup truck not unlike my own. If not for the truck color being different, I might have mistaken him for me, as it is quite common to meet one’s self both coming and going in the lonely and mysterious desert surrounding the Kin Klizhin Ruin.